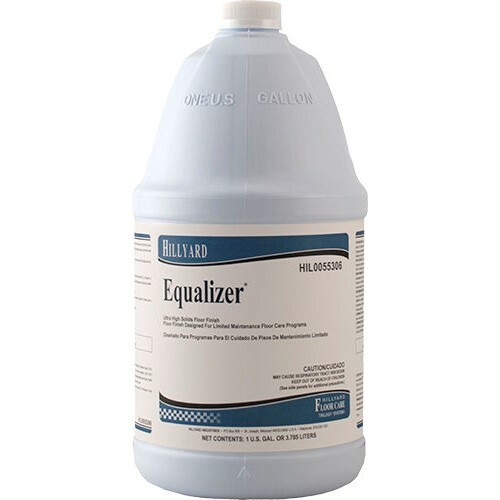 Equalizer, an ultra high solids finish only requires 3 coats for maximum shine. Patented polymers make for a next generation formula. Equalizer will significantly lower the cost of cleaning by providing far less labor to the stripping and reapplication process than was ever thought possible. No seal is necessary unless the floor is extremely porous. Equalizer has excellent dirt resistance. It provides resistance to black marks, scuffs, scratches, and heel marks. Little to no buffing is required. Once floors are coated with Equalizer, daily or weekly maintenance is much easier.